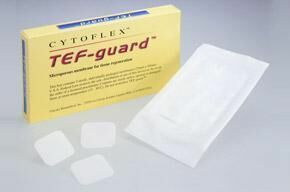 CytoFlex® is a non-resorbable membrane for use as a space-making barrier in guided tissue regeneration procedures. CytoFlex® has a surface texture and porosity suitable for adhesion of host cells to the material while preventing passage and integration of bacteria within the interstices of the material. The supple membrane conforms easily to tissue contours, and yet offers sufficient stiffness to maintain a space over the bony defect. The smooth, micro-texture surface is designed to improve flap attachment but prevent tissue and bacteria ingrowth. FDA has approved Cytoflex® for use as a barrier membrane in the treatment of periodontal defect using guided tissue regeneration procedures.